Risk and South African cricket have not made a happy couple in the past, but they've decided to give their relationship another try. They're being thrust on the same plane to next month's World Cup and will have no choice but to make it work, if South Africa are to have any realistic chance of going all the way. South African cricket is characterised by its penchant for being calculating, for carefully mapping out formulas and executing them according to plan and their usual precise preparations are certain to take place. The element of chance that courts them is caused by pure circumstance, it's written into the very fibres that make up the 15 men they've chosen to take them to glory in the subcontinent. South Africa go into the tournament with only one tried and tested big-hitting, wicket-taking allrounder - Jacques Kallis - and he is recovering from an injury sustained to his hip during the recent Test series against India. 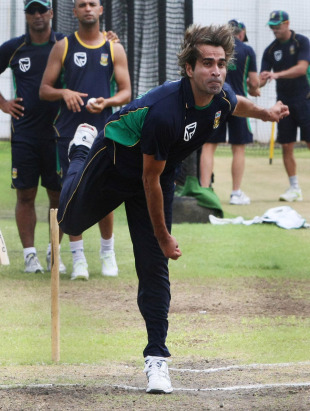 For the first time since 1996 they have a wrist spinner, but Imran Tahir has yet to make his international debut. Only four of the players have World Cup experience, and only three of those are certainties in the starting XI - captain Graeme Smith, Kallis and AB de Villiers - which means eight players could be on World Cup debut in a month's time against the West Indies. It is this relative inexperience which will be South Africa's biggest test in the tournament as it will be the first time they are taking so many fresh faces to the global showpiece. In 1992, the team was new to the international stage but had a wealth of first-class knowledge. In every tournament since then, they have had a settled first-choice XI. This time around, as the ODI series against India showed, almost no-one's place is guaranteed and the combinations don't have a settled fit. Instead of worrying about the perceived lack of stability, Smith sees it as a positive. "Our squad is unpredictable," he said after the fifth ODI against India in Centurion. "It's the first time we are going to a World Cup with so many options and it will allow us to pick the best XI on the day." Kallis' return to full fitness will make a major difference to the balance of the side, particularly from a batting perspective. With Kallis set to return to his position at No. 3 in the line-up, it will allow one of Colin Ingram or Morne van Wyk to bolster a brittle lower-middle order. South Africa's long tail, which started at No. 7 with Johan Botha in the series against India, was exposed over the five matches, and Kallis' return should help them solve that problem. Hashim Amla will be expected to play the anchor role with Kallis, something he recognised during the India series. Amla blazed his way to two half-centuries in Durban and Port Elizabeth and looked like he was aiming to transform himself into a bearded Herschelle Gibbs. He knuckled down to score a more composed century at Centurion and even said that he was given a "reminder of his role in the team." de Villiers' form with the bat will be a concern, with him only scoring 114 runs in the five matches against India and looking scratchy. Critics will immediately say that the responsibility of wicketkeeping and batting is becoming too much, but Smith thinks all de Villiers needs is some time off to rejuvenate. "I am not worried about him. He has had a long summer, he just needs some rest. I expect him to be strong in the World Cup," Smith said. South Africa's big variable factor at the World Cup is likely to be in the bowling department, and they've attempted to cover all bases. Four seamers and five spin options, three of which are frontline spinners, make up their attack. Dale Steyn, Lonwabo Tsotsobe and Morne Morkel are 'safe' in terms of their form, while Wayne Parnell has been a worry. Since recovering from his groin injury, he has had a slight remodel of his action, particularly his stride through the crease, and has struggled for consistency. He is still deadly on his day but was expensive against India. South Africa may have to get used to playing more than one spinner, something they have dabbled in only occasionally. Johan Botha is still the first choice, while Faf du Plessis made a strong case for his inclusion with solid performances against India. JP Duminy and Robin Peterson are likely to share the fifth bowlers' duties with someone else, while Tahir is expected to be the wicket-taker. He was part of the squad that played against India but was only spotted carrying drinks. Smith said there was a method behind the madness. "It was a tactical decision. We felt there is enough time for him to play in the warm-ups and our batting was slightly light. He is someone we want to keep fresh and we didn't want to give people the opportunity to see too much of him." The reasoning behind this might come across as strange since Tahir has spent many seasons playing in the UK, and represented three different counties. In an age where video footage is readily available, it would be absurd if teams have not done their homework on Tahir. Of course, facing him and watching him are two different things and it seems that South Africa are relying on the element of surprise to do the trick for them this time. Now that's risky.